Popayán is the capital of the Colombian department of Cauca. It is located in southwestern Colombia between the Western Mountain Range and Central Mountain Range. It has a population of 258,653 people, an area of 512 km2, is located 1760 meters above sea level, and has an average temperature of 18 °C. Repoussé or repoussage is a metalworking technique in which a malleable metal is ornamented or shaped by hammering from the reverse side to create a design in low relief. It is a form of toreutics. 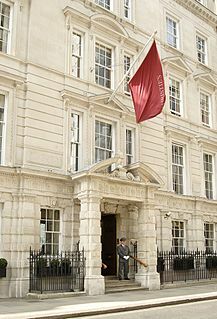 Christie's is a British auction house. It was founded in 1766 by James Christie. Its main premises are on King Street, St James's, in London and in the Rockefeller Center in New York City. The company is owned by Groupe Artémis, the holding company of François-Henri Pinault. Sales in 2015 totalled £4.8 billion. In 2017 the Salvator Mundi was sold for $450.3 million at Christie's, and which at that time was the highest price ever paid for a single painting at an auction. Holy Week in Christianity is the week just before Easter. It is also the last week of Lent, in the West, – Palm Sunday, Holy Wednesday, Maundy Thursday, Good Friday, and Holy Saturday – are all included. However, Easter Day, which begins the season of Eastertide, is not. Although, traditions observing the Easter Triduum may overlap or displace part of Holy Week or Easter itself within that additional liturgical period. Worldwide The Confraternity of the Immaculate Conception of the Blessed Virgin Mary is one of the oldest lay apostolates still operating in the Roman Catholic Church, having been part of the Congregation of the Marians of the Immaculate Conception founded by Saint Stanislaw Papczynski. <"The Blessed Marian Founder fervently encouraged his spiritual sons to establish confraternities of the Immaculate Conception at Marian churches. The first laws of the Order of 1694-1698 speak of this already." The Indianapolis Museum of Art (IMA) is an encyclopedic art museum located at Newfields, a 152-acre (0.62 km2) campus at the corner of 4000 N. Michigan Road and W. 38th Street, near downtown Indianapolis, northwest of Crown Hill Cemetery. Newfields also houses the Lilly House, The Garden, The Virginia B. Fairbanks Art & Nature Park: 100 Acres, the Beer Garden, and more. There are exhibitions, classes, tours, and events, many of which change seasonally. The campus was re-named in 2017 to better reflect the breadth of offerings and venues. Muzo is a town and municipality in the Western Boyacá Province, part of the department of Boyacá, Colombia. It is widely known as the world capital of emeralds for the emerald mines containing the world's highest quality gems of this type. Muzo is situated at a distance of 178 kilometres (111 mi) from the departmental capital Tunja and 118 kilometres (73 mi) from the capital of the Western Boyacá Province, Chiquinquirá. The urban centre is at an altitude of 815 metres (2,674 ft) above sea level. Muzo borders Otanche and San Pablo de Borbur in the north, Maripí and Coper in the east, Quípama in the west and the department of Cundinamarca in the south. Chivor is a town and municipality in the Eastern Boyacá Province, part of the Colombian department of Boyacá. The mean temperature of the village in the Tenza Valley is 18 °C (64 °F) and Chivor is located at 215 kilometres (134 mi) from the department capital Tunja. Chivor is world-famous for its emeralds. Gachalá is a municipality and town of Colombia in the Guavio Province, part of the department of Cundinamarca. The urban centre of Gachalá is situated at a distance of 148 kilometres (92 mi) from the capital Bogotá at an altitude of 1,712 metres (5,617 ft) in the Eastern Ranges of the Colombian Andes. The municipality borders the western portion of the split municipality Ubalá and the department of Boyacá in the north, the eastern part of Ubalá and Medina in the east, Fómeque, Junín and Gama in the west and Fómeque, Medina and the department of Meta in the south. The Andaquí are an indigenous people of Colombia, who live in the Upper Caquetá River Basin, the Fragua Valley of Cauca Department, and the Suaza Valley of southwest Huila Department. Cauca culture is a pre-Columbian culture from the Valle del Cauca in Colombia, named for the Cauca River. Middle Cauca culture dates from the 9 to 10th centuries CE. The Muzo people were a Cariban-speaking indigenous group who inhabited the western slopes of the eastern Colombian Andes. They were a highly war-like tribe who frequently clashed with their neighbouring indigenous groups, especially the Muisca. It is said they performed cannibalism on their conquered neighbours. The Tegua or Tecua were an Arawak-speaking indigenous people of Colombia who died out in the 19th century. This article describes the economy of the Muisca. The Muisca were the original inhabitants of the Altiplano Cundiboyacense, the high plateau in the Eastern Ranges of central present-day Colombia. Their rich economy and advanced merchant abilities were widely known by the indigenous groups of the area and described by the Spanish conquistadores whose primary objective was the acquisition of the mineral resources of Tierra Firme; gold, emeralds, carbon, silver and copper. This article describes the art produced by the Muisca. The Muisca established one of the four grand civilisations of the pre-Columbian Americas on the Altiplano Cundiboyacense in present-day central Colombia. Their various forms of art have been described in detail and include pottery, textiles, body art, hieroglyphs and rock art. While their architecture was modest compared to the Inca, Aztec and Maya civilisations, the Muisca are best known for their skilled goldworking. The Museo del Oro in the Colombian capital Bogotá houses the biggest collection of golden objects in the world, from various Colombian cultures including the Muisca. Luis Lanchero, also known as Luis Lancheros was a Spanish conquistador and the founder of the town of Muzo, Boyacá, the most important emerald settlement in Colombia. Muzo was founded after twenty years of unsuccessful attempts to subjugate the Muzo to Spanish rule. Lanchero arrived in the New World in 1533 and died impoverished in Tunja in 1562. 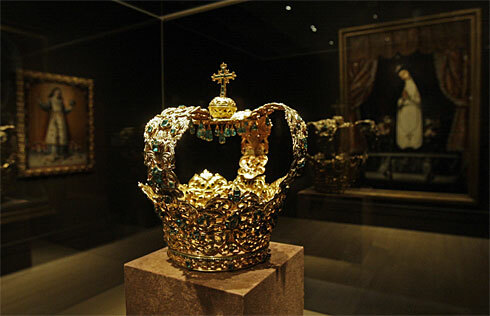 1 2 "Crown of the Virgin of the Immaculate Conception, known as the Crown of the Andes". Metropolitan Museum of Art . Retrieved 13 March 2017. ↑ Jewel: A Celebration of Earth's Treasures. Dorling Kindersley Ltd. 2016. p. 231. ↑ Frank W. Thackeray; John E. Findling (2012). Events That Formed the Modern World. ABC-CLIO. p. 236. 1 2 Norman, Geraldine (18 June 1995). "Crowning Glory of the Andes". The Independent on Sunday . ↑ Germán Izquierdo Manrique (October 2006). "La Corona de los Andes: La más bella de las coronas religiosas está en USA y debería estar en Colombia". CiudadViva. Instituto Distrital de Cultura y Turismo. Wikimedia Commons has media related to La Corona de Nuestra Señora de la Asunción de Popayán .